The Groundswell full overdrive with a natural response to picking intensity. It features two transistor based gain stages, so it doesn't have that artificial over-clipped sound like many "overdrive pedals" out there. No compression, just gain and drive! Dual gain stages and a voltage reducer that alters total amount of gain, as well as feel and response to pick attack. I originally built the Groundswell for myself, my goal being a unique overdrive with a natural feel and sound. After getting a lot of requests to build more, I decided to make it available in small quantities. Users' reactions have been really exciting! Solder your favoured diode pairs between lugs 1 & 4, and 3 & 6. I suggest 2 top to tail 1N4148s or maybe 1N4001s one side and maybe a couple of LEDs or germanium diodes at the other. 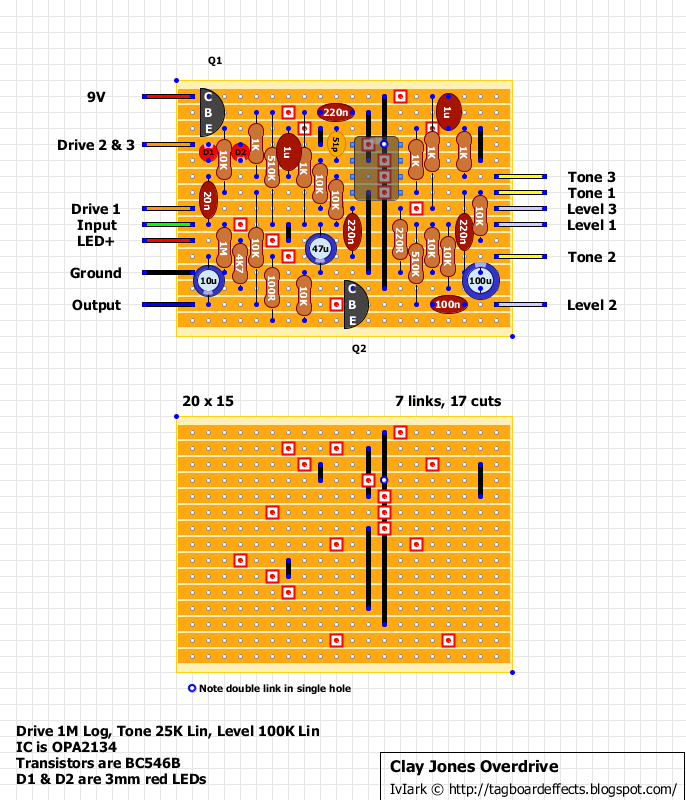 The middle position will then be the diode life stock pedal mode. 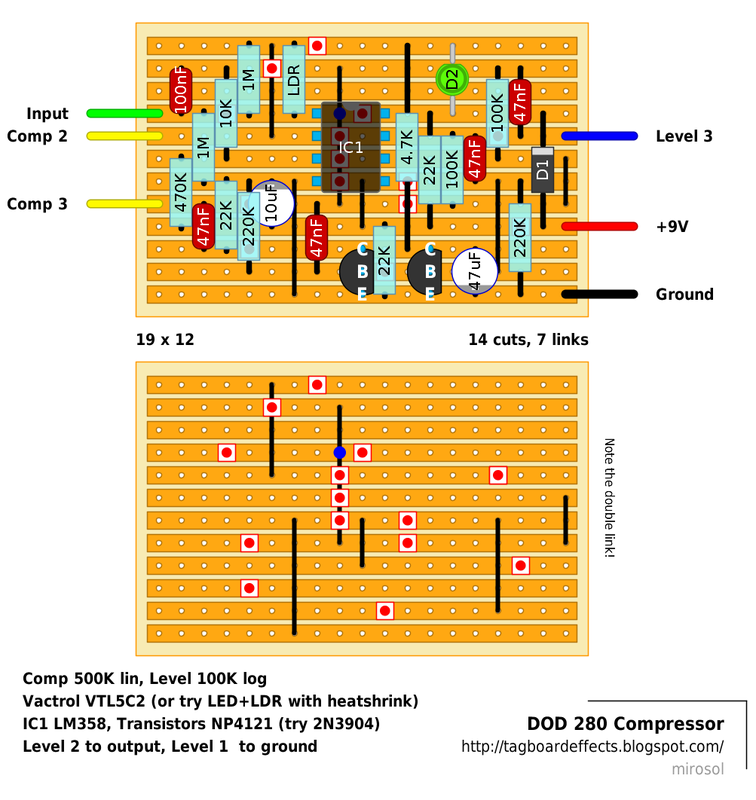 Here we go with another classic optical compressor. Original unit uses VTL5C2, so could get away with using any LDR with 1M dark resistance. So the LDR resistor would be resistor leads of VTL5C2 and that green LED acts as LED leads of the vactrol. Positive/anode to strip four and negative/cathode to strip one. Haven't built it myself yet.. The Bad Monkey is a very popular low cost pedal which most people have assumed to be a simple Tubescreamer clone but is a little bit more than just a verbatim TS808. It actually bears a lot more resemblance to the DOD Juice Box which is handy because the person who did the trace couldn't get a couple of the cap values and so they have been inferred from the Juice Box schematic. The cap values that were unknown were the 51p and the 220p. The 51p will be fine and is a commonly used value for this kind of filter (increase if you want to soften the distortion more), but you may want to experiment with the 220p and so I'd suggest socketing that one and seeing what you come up with. If you want a bit more gain from it, try increasing the 100K Gain pot. The Bad Monkey Tube Overdrive gives your amp a boost just when you need it. It has been compared to the TS-808 but with having the unique ability to smooth out the distortion by use of the low and high EQ controls. Most overdrive pedals give you one tone control knob thus limiting your tonal options. You asked for a pedal that will maintain your guitar's distinct tone and DigiTech delivered! With its rugged design, separate mixer and amp outputs, and amazing tonal options, this pedal truly is a Bad Monkey. From Blues to Rock to everything in between, it will give you that amazing overdriven tube amp sound that will keep begging you to crank it up! From ROG:The Tonemender is a very flexible, yet simple clean boost with a 3-knob tonestack that allows the user to re-create the classic Fender, Marshall and Vox responses. 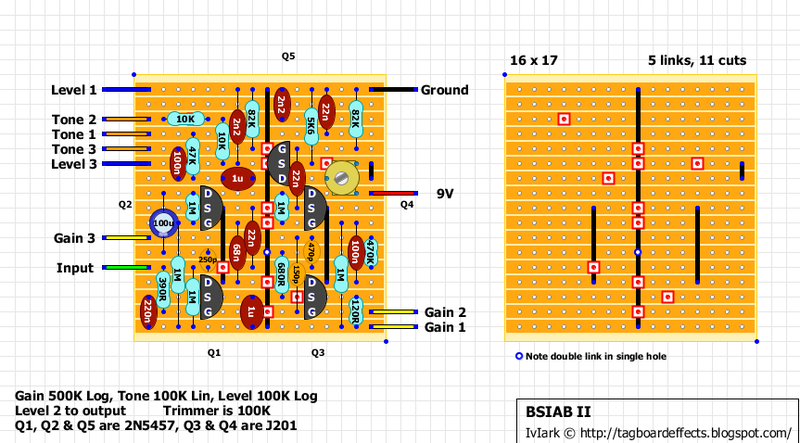 We suggest using a TLC2272 for the dual op-amp. The TLC2272 is rated for low-noise and rail-to-rail output, which will offer the highest possible clean boost and dynamic range. The NE5532 is another good choice, but a TL072 can also be used with decent results. The Mid Shift switch (SW1 on the schematic) selects the center frequency of the midrange dip in the response. The center frequency is moved from around 700Hz (Marshall/Vox) down to 400Hz (Fender) in the HI and LO settings, respectively. For Fender-style curves, the Mid Shift is placed in the LO setting (closed). 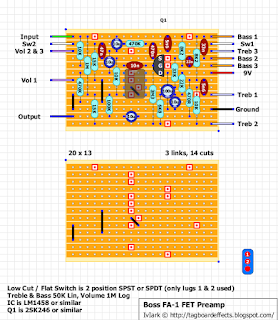 To replicate Marshall-style curves, switch the Mid Shift to the HI position (open). Set the Mid control between 12:00 and 5:00 for traditional Marshall settings, with lower settings providing additional flexibility. For a Vox-style response, keep the Mid Shift in the HI setting and set the Mids control fixed at 10:00 and move the Bass between 7:00 and 12:00. A "flat" equalizer position is set with the Bass and Treble both at minimum, and the Mid control at its midpoint. When Bass and Treble are fully cut, the Mid knob acts as an additional Level control, which is a familiar characteristic of the Fender tonestack. I've thrown out the previous version as this one is simply better. And definitely verified. 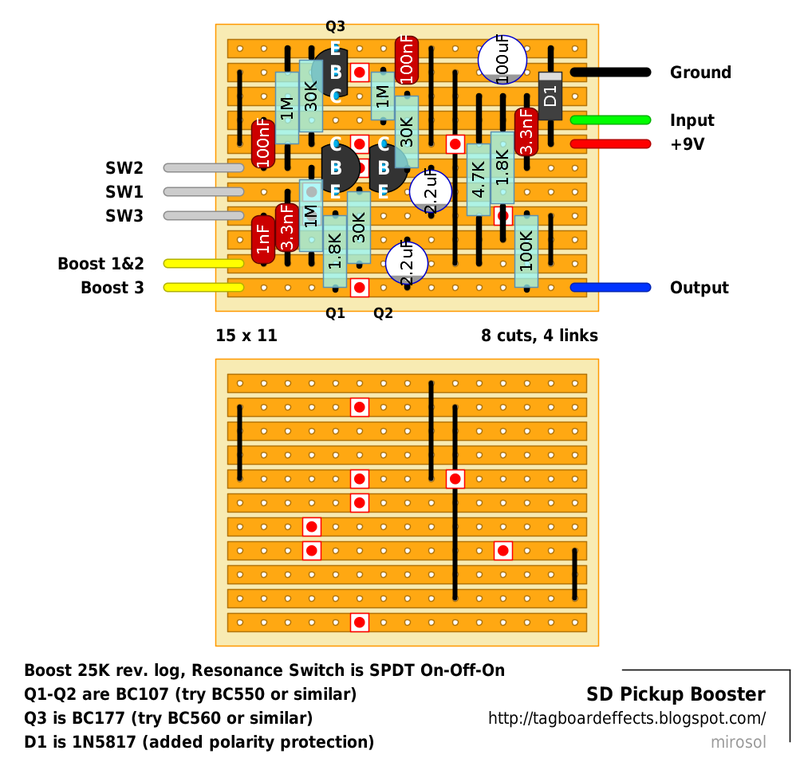 There's quite a lot of gain coming from the circuit, so some squeels and noise from the unboxed circuits are expected. Geiri's demo of his awesome Double Tonemender! The FA-1 is an incredibly small Field Effect Tramsistor (FET) based pre-amp. The controls are real easy. There's controls for volume, bass, treble and a low cut filter switch. The amplification is as much as 20 times (26dB) and it has an input impedance higher than any other device. The first effects pedal designed specifically to work together with the pickups in a guitar to achieve optimum gain and resonance for all tonal applications. Works with all musical styles. By turning the gain control knob you can add pure, flat-EQ gain, ranging from 6dB to 25dB! The Resonance Switch drops the resonant peak of a single coil pickup up to 5KHz, making a single coil sound like a full and fat humbucker. Features fully discrete Class A circuitry along with true bypass. Comes in a heavy-duty steel chassis and runs on a single 9 volt battery. 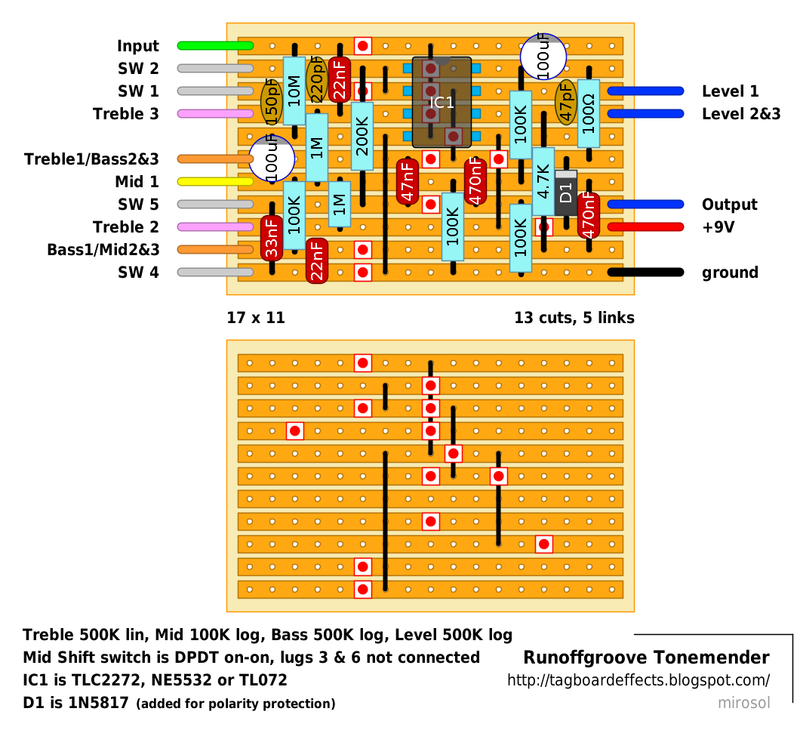 For Resonance Switch to work properly, the SFX-01 must be first in the signal chain using passive pickups and a standard guitar cable -- not a wireless unit. Anyway. Here's another 60's "classic". Ugly and mean. Simple, yet effective. 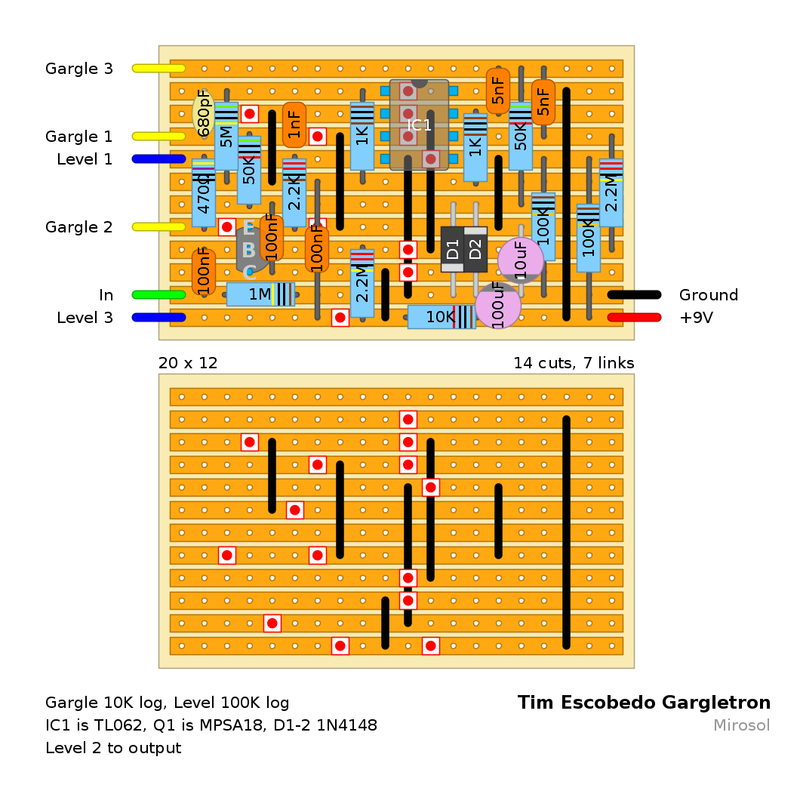 Added both versions; Silicon and Germanium. Please take note that the Ge version is positive ground with PNP germanium transistors, while the Si version is NPN with negative ground. One of the most sought after limited run boutique pedals ever, with them going for over $1500 on eBay, and surprise surprise ..... it was a Tubescreamer that had TGP creaming themselves. Nothing new there then. Brown Sound In A Box version 2 (BSIAB2) is an excellent distortion pedal designed by Ed Guidry. 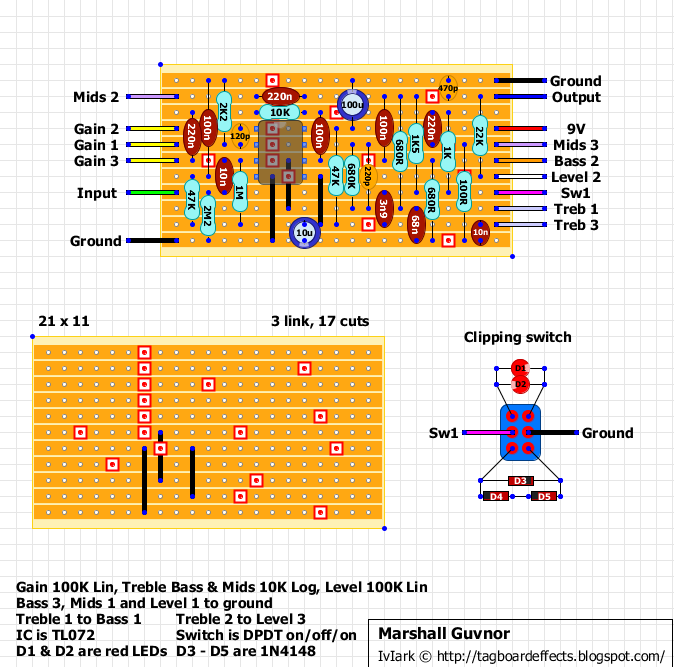 Based on the AMZ MiniBooster cascading work done by Jack Orman and further refined by Aron Nelson and Doug Hammond. This is one of the best heavy Marshall-type distortion boxes that we've heard and it also performs very well on low drive settings. Phew. This board almost made me crazy. There is "only" 28 cuts and 11 links, but i got down to only one resistor over one strip. This one is quite interesting. 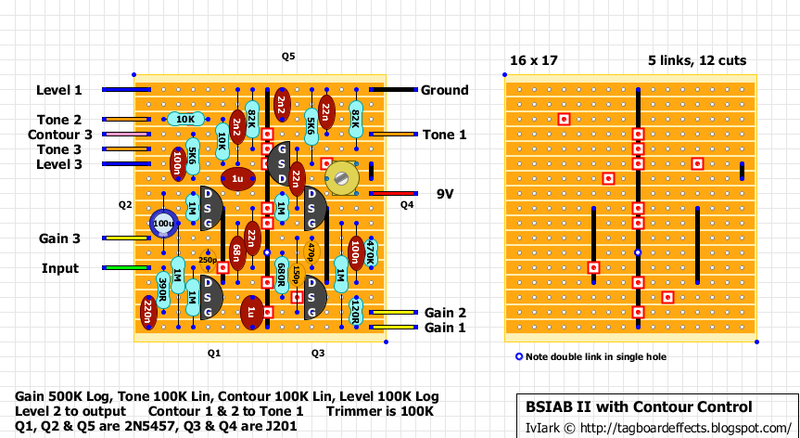 CMOS Hex inverter based BMP adaptation. 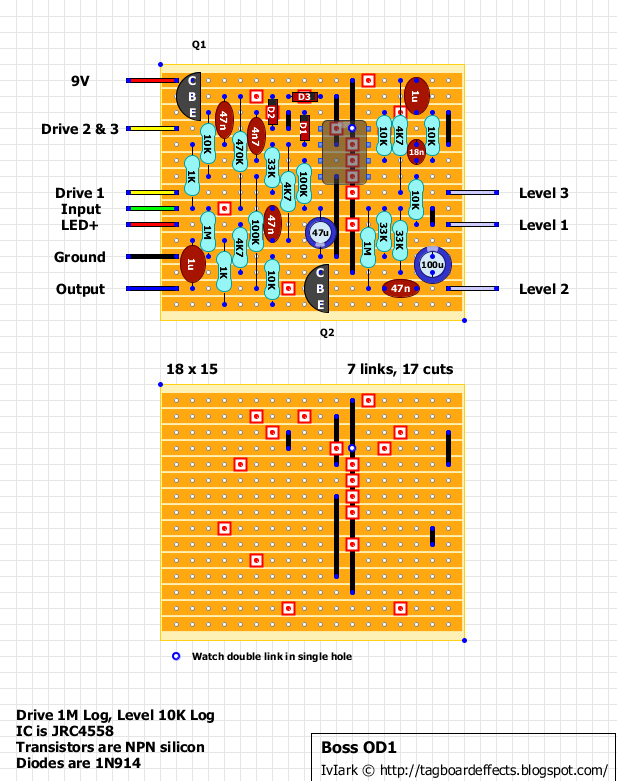 This circuit was born with the idea of making a CMOS workalike of the well known Electro-Harmonix Big Muff Pi (BMP). We chose the name Twenty-two Sevenths or 22/7 since it is a rational approximation of pi. 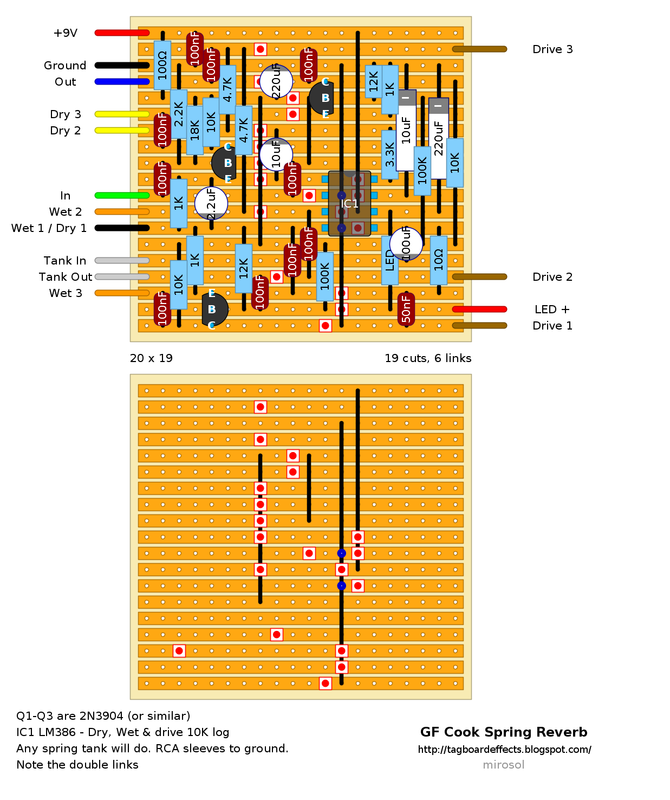 The gain and frequency response of each stage were adjusted to match the corresponding stage on a BMP. The result is a rich and full sounding pedal that evokes some of the fuzz sounds circa 1969, as well as some classic singing leads. Through the years several variations on the tonestack have appeared, but after studying their variants we concluded that these differences correspond more to parts value availability rather than a significant difference in sound. So, the tonestack components were chosen to obtain an "average" BMP sound, which is referred to as CLASSIC mode in this implementation. 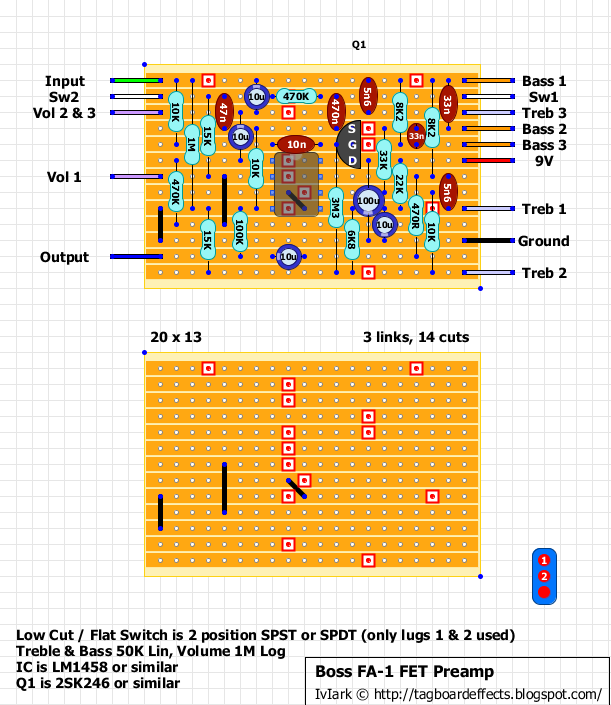 In addition, a center-off DPDT switch was added in order to obtain two additional sought after sounds from the tonestack: a FLAT setting and a deeper SCOOP mode. In this way, the sonic palette of the 22/7 is greatly expanded. The interstage coupling caps have been observed to vary between 100nF and 1uF in different versions of the BMP. In this implementation we chose 100n, which produces a more balanced bass/treble mix that works well for chords as well as soloing. 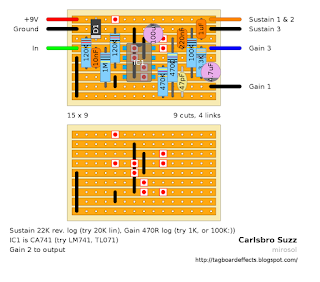 If you want heavier and fuzzier bottom end as found in some BMP versions, you may want to replace the five 100nF caps with 1uF. 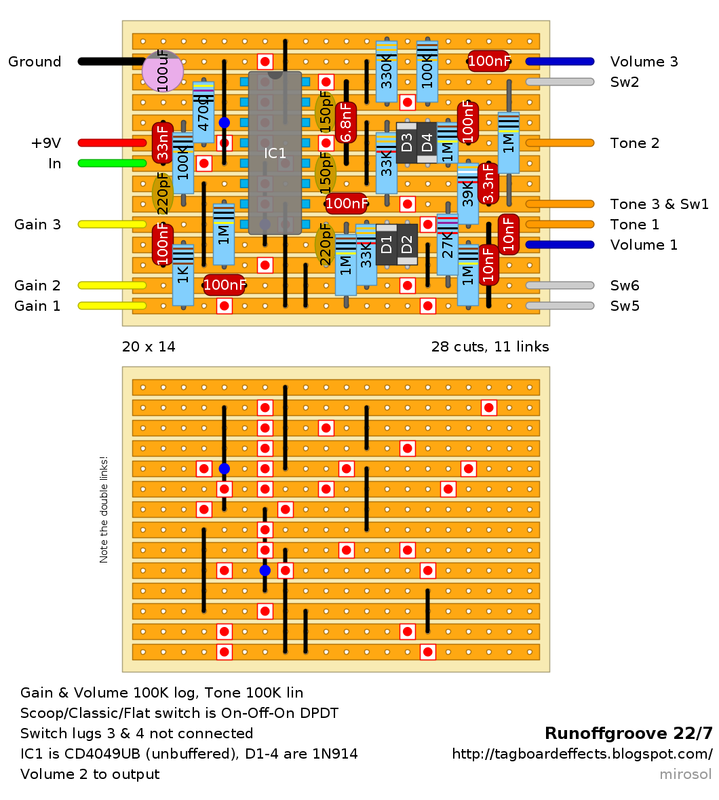 As this is a high gain circuit, good layout and cabling practices are critical for good performance. Apart from recommending shielded cable for input and output wiring, the entire circuit should be well shielded inside a metallic enclosure so as to reduce AC mains hum pickup to a minimum. Around 1965, Marshall introduced a few amps built around an 18 Watt EL84 powered circuit. While these models were intended for practice, the sound was much better than other small amps. Unfortunately, only a few hundred of these combos were manufactured over the next three years. These rare amps were given the model numbers 1958 for the 2X10" combo, 1973 for the 2X12" combo, and 1974 for the 1X12" version. 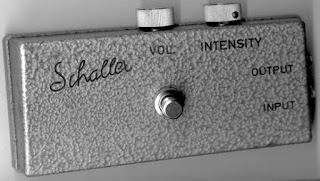 The features were two channels with Volume and a single Tone on each, along with Tremolo on one channel and an optional Reverb. The 18W amps consisted of 3 12AX7 type tubes and a pair of EL84 power tubes in push-pull configuration. 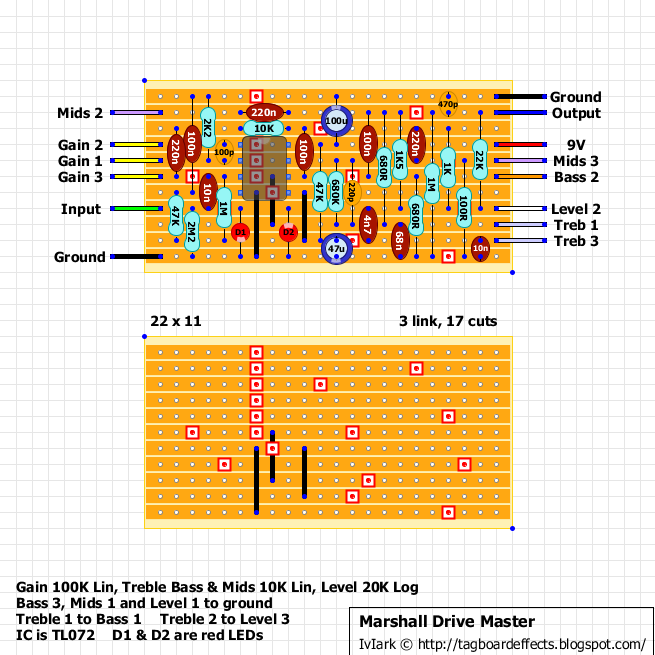 Legend says Jim Marshall bought the circuit from Watkins Electric Music. Watkins sold a very similar amp they called the "Watkins Dominator." An internet group for cloning these amps has been established at www.18watt.com. 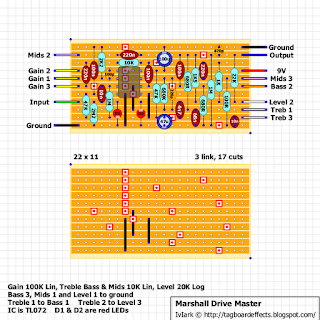 On this site, you will find a verified schematic for the 18 Watt combo. After hearing the sound samples there, we decided to give this circuit a try as a distortion stompbox with FETs in place of the tubes. We opted to recreate the normal channel. The circuit consists of only one preamp stage, a volume and unique tone control setup, the phase splitter and a single power stage. There is no negative feedback, so distortion will be much easier to achieve. 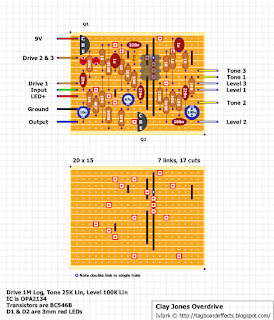 You may notice we used 8k2 as the value of R17 on the 18watt.com schematic. 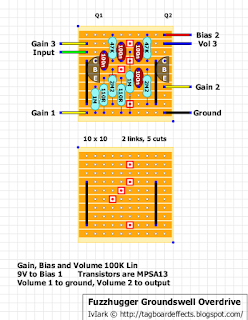 The reason for this is to scale the voltages of the associated JFET to the voltages of the amp. We did find that the sound was closer to the amp when we did this, instead of arbitrarily choosing a value. Please feel free to experiment with this resistor on your own. Although the components designated do not look to be typical Marshall, they do produce results very similar to the soundclips of the amp. 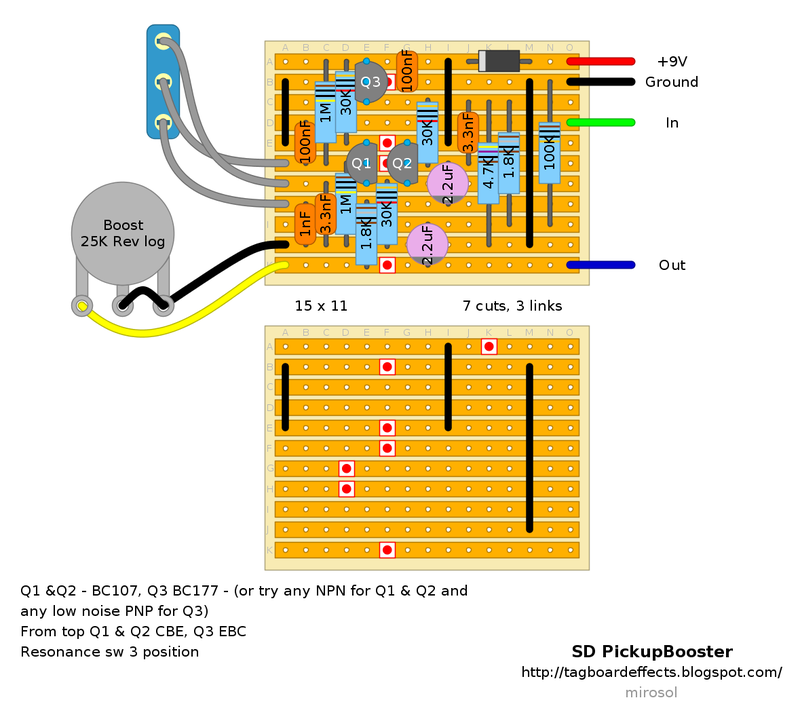 Great rock and blues sounds are readily available with this circuit. 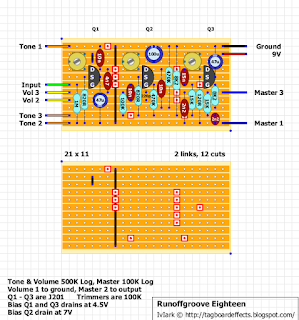 Use 1M pots for Volume and Tone. It has been documented that some 18W Marshalls were fitted with these instead of the 500k pots specified on the schem. Add the treble bleed cap to the Volume control to brighten the amp. 220pF is a good starting point, but other values will also work well. Experiment with different JFETs (use sockets!) in any or all positions. 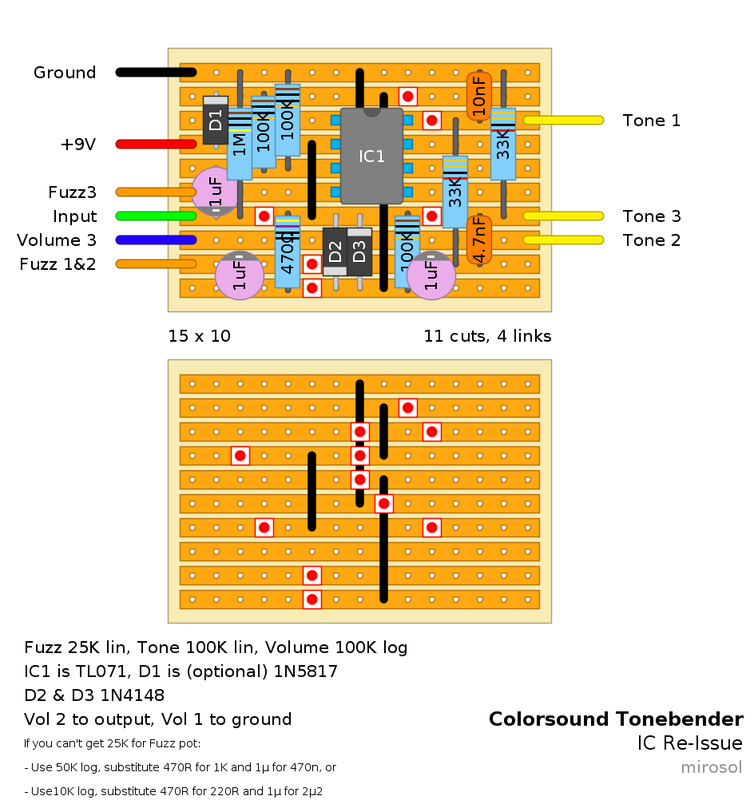 Try different values for the 4n7 and 10n caps on the Tone control to change the response. Sockets may also be helpful here. 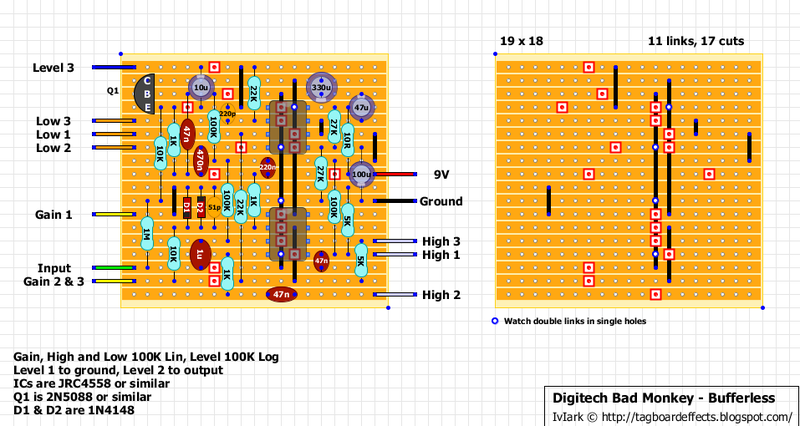 The 100k resistor is another point for tweaking. Gus Smalley modded the circuit from Aron. Aron modded it from tonebender. Both made enhancements and mods along the way. Or so the internet tells me. Anyway. It's supposed to be a silicon adaptation of the classic. 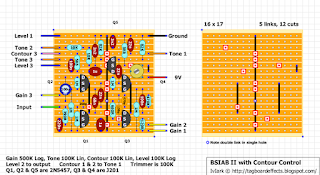 It says 2N5089 on the schematic, but i would suggest trying out something a bit lower gain - like 2N2222 or BC109B. 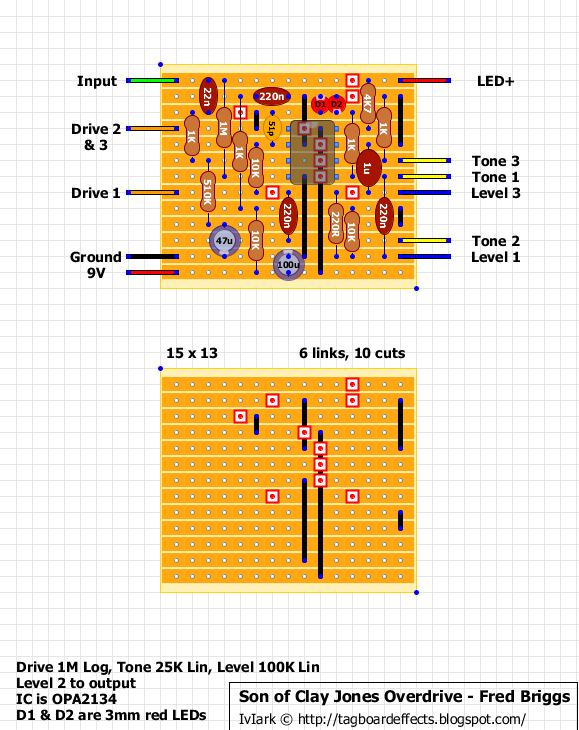 Built this last night, just to avoid any issues with it :) Works - and it's definitely not a bad fuzz. I used MPSA18s on my test build, and those work well too. Those were lying around on my desk so i just sticked them in. Didn't socket them so i can't easily try on any lower gain ones in there. But you should. Point in 2N5089s must be within the noise levels. Still. I like this one. 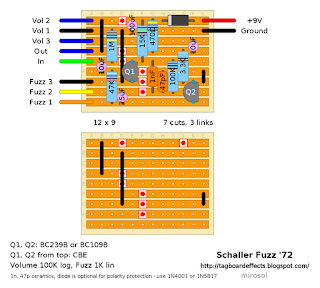 It's not a Fuzz Face, it's not BMP, and it doesn't feel that much like the tonebender either. 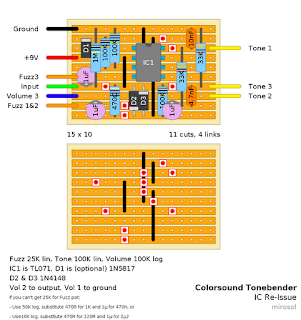 Tone control may feel a bit odd, but that's to be expected. After all, it is a four transistor tonebender mod. Requested by a few people, this is the pre-amp section of the rack mounted Korg SDD-3000 digital delay. One for the U2 fans who want to try to get a bit closer to The Edge's tone. 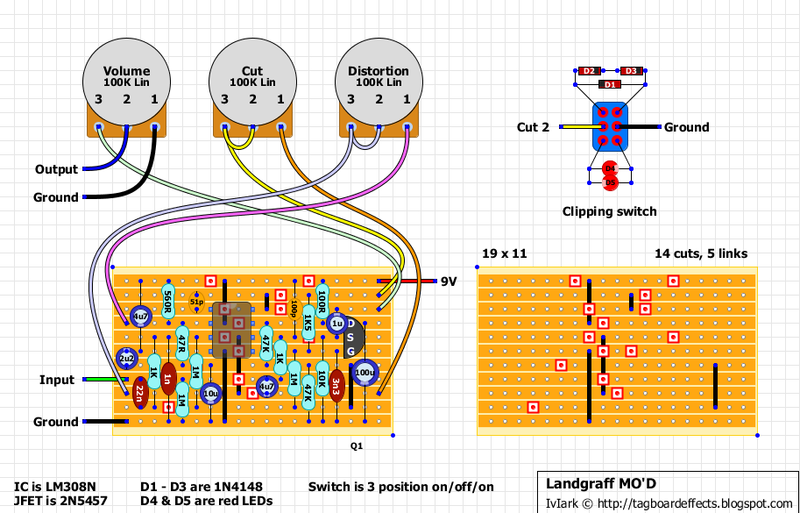 This one based on Analogguru's schematic with a simplified 9V supply. 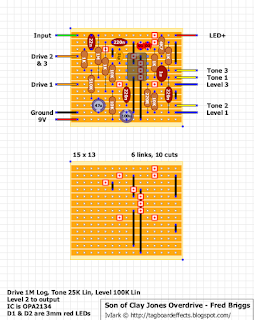 The LFO section is *very* sensitive to both voltage and current, so if your board doesn't fire up right away (which happened with my second build too), you should consider doing a little daughterboard with 9V regulator, 8V2 zener and a 10-50 trimmer to get the LFO going. That being said - this is not a project for beginners. Mr. Hollis has been known for his modulation circuits. This one seemed like an interesting build so i drew it up. Once again. I'm more or less out of sources for the demos and so on. But i have a hunch that this may be 1:1 with two knob version of Copilot FX Android... Anyway. The circuit does tremolo from mild to wild and flick of a switch turns it into super mean ring modulator - with lots of good stuff on the sweep. Or so i'm told. Straight from the music forum equivalent of the Freemasons, without the funny handshake but your membership can be black-balled. 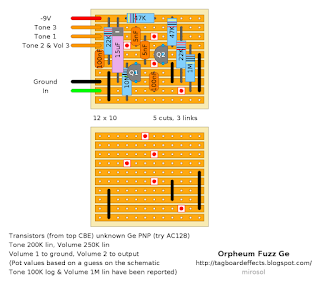 The original has a trimmer for gain but I have put this as an external pot for my own personal preference in muff-like pedals. 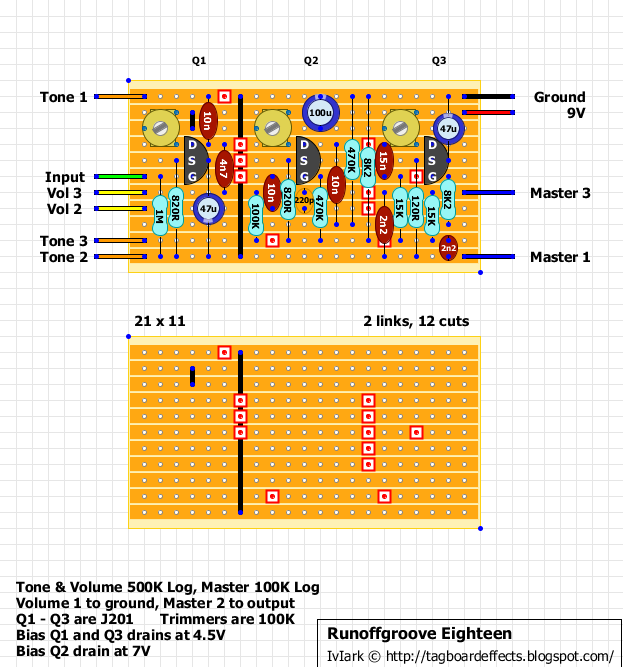 If you'd prefer to keep it authentic then remove the wires and either put a long lead trimmer in there like the Alps RH06, or using flying leads and have a little gain trimmer daughterboard like this. Argh. I just hate it when i draw a layout and when i'm posting it, i can't find anything but just a few photos of the original unit - No ad texts, no original ads no nothing. Just a few images from google image search and one youtube clip from different design by the same manufacturer. So i have to go it alone. 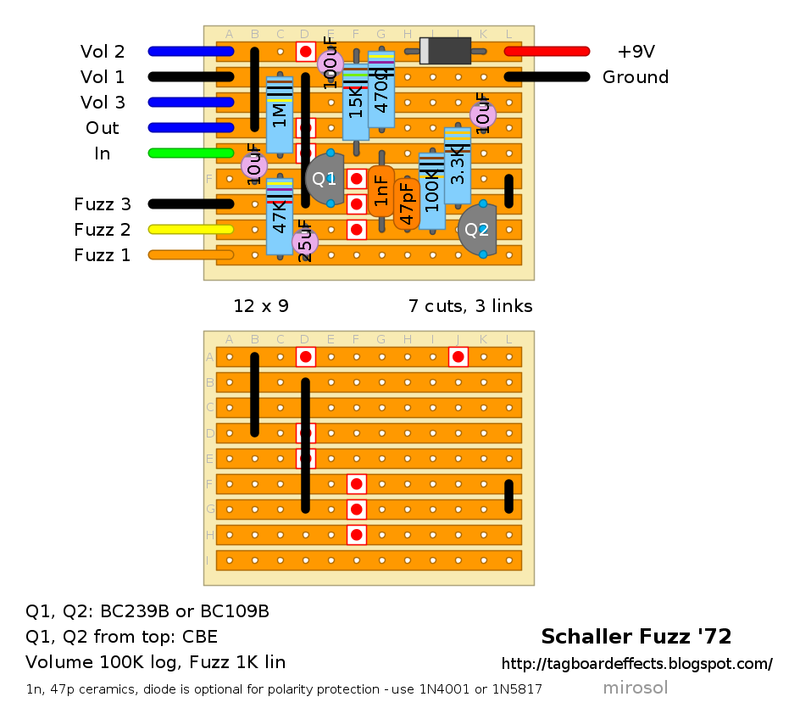 Schematic and circuit blueprint does not differ that much from Fuzz Face, so it's safe to assume that this was german made FF-clone of the seventies. 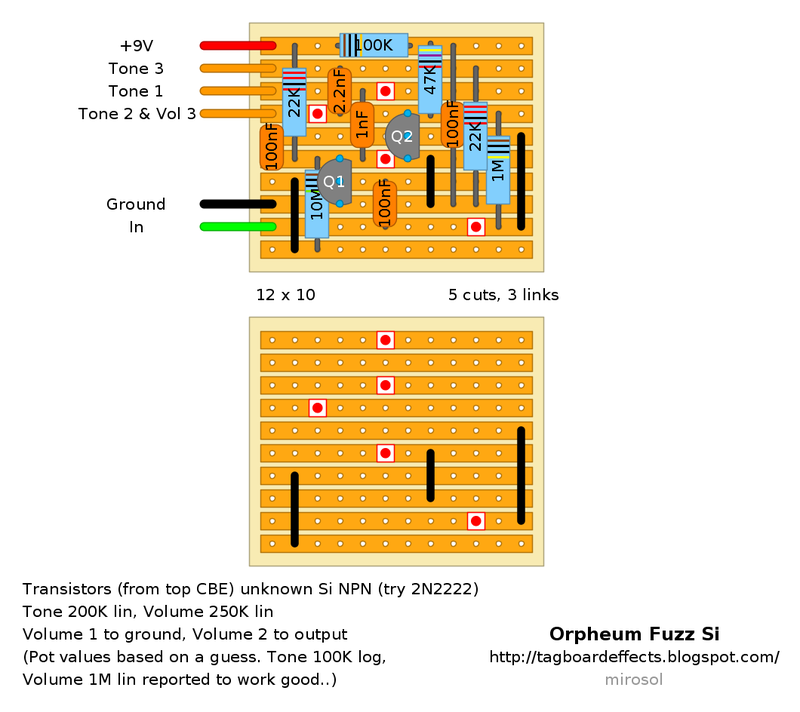 Some values are slightly different, but, it basically sounds just like any other silicon Fuzz Face. Built it myself, and i like it. Not a bad thing to have. 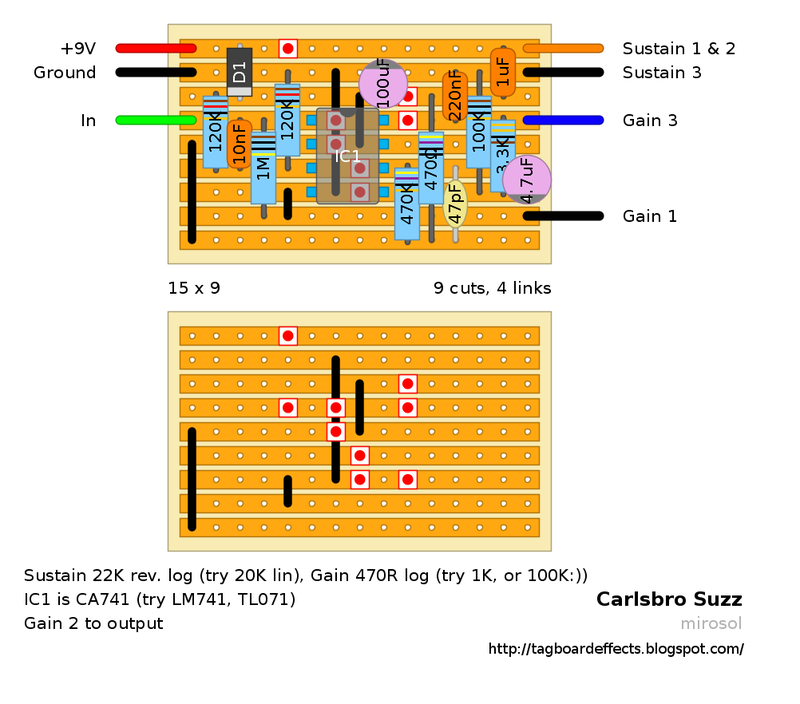 Use as low hFE transistors you can get. 2N2369 and 2N3903 are good candidates... Built mine with 2n2222 TO-18 metal cans, and.. You guessed it.. 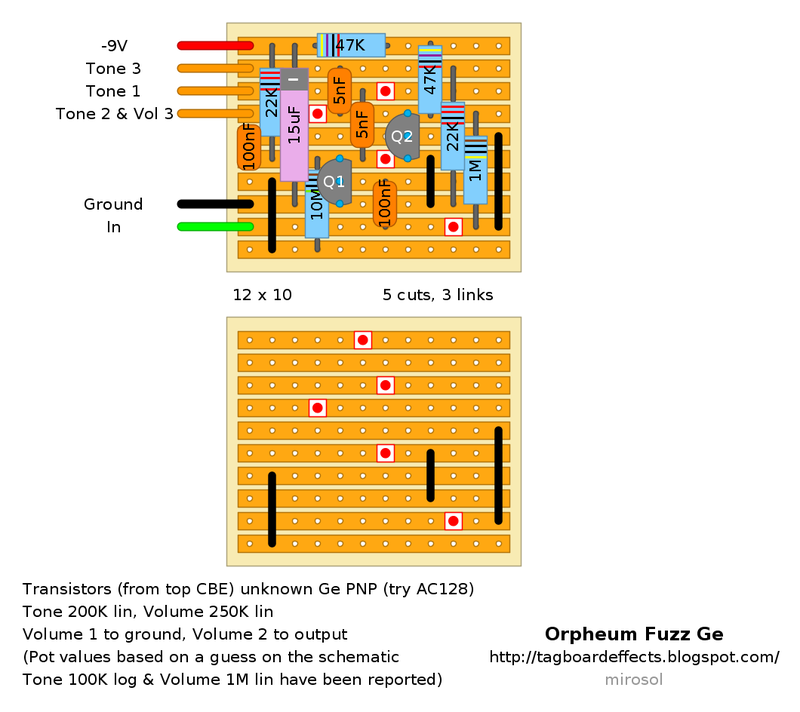 It's not that far from my 2N2222 Si Fuzz Face clone - or from my Vox Tonebender '66 clone. So it's not super pretty, but interesting FF adaptation anyway. 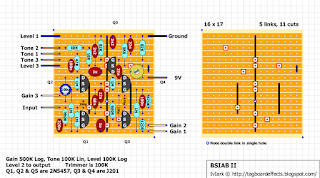 If your Q2 bias needs some tweaking, that 3K3 resistor is good place to start. Replacing that with 10K trimmer wouldn't be too back of an idea. 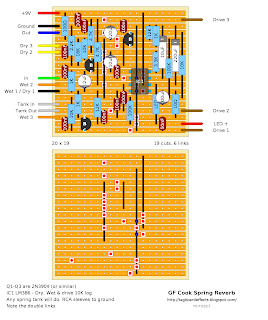 One could move that electrolytic connected to 3K3 three columns left and place trimmer as simple variable resistor between rows four and six. Did that to my board, and it's at its sweetest around 4K7-5K. The OD-1 is by now legendary. 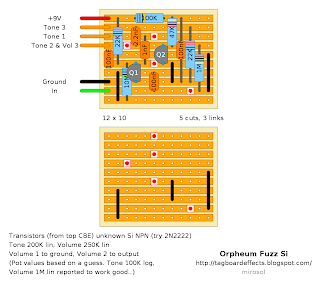 Artist of the 70's was mostly using a fuzz distortion sound and the overdrive produced by the OD-1 was not typical. It was however soon accepted as the new standard of guitar sound. The OD-1 features an asymmetric circuit where the positive and negative halves of the waveform isn't distorted equally. The sound is therefore still close to the original even though distortion have been added. Once again. This one has surprisingly little info around the internets. Seems like a nice alternative for Distortion+. Nice, simple build anyway. Here's a vintage Carlsbro Suzz from the seventies. The name seems to imply that this would be some sort of fuzz pedal, don't you think? 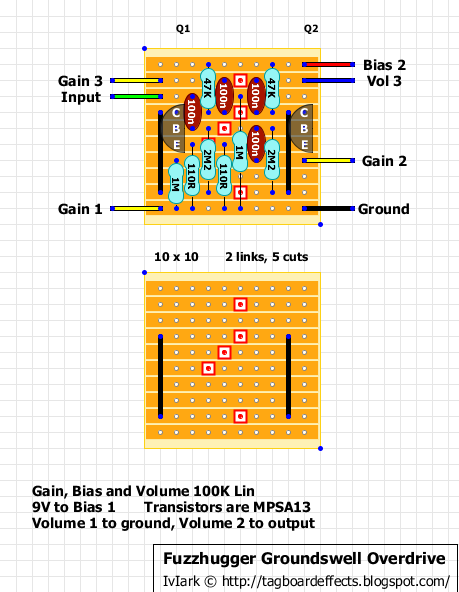 Alas, the circuit has more in common with an MXR Distortion + really. So if you're expecting some sort of nasty fuzz, you may be in for a let down. But if you look at it in the proper context, as more of a basic distortion, then it's not too bad at all. Add to that the collectibility of those funky enclosure Carlsbro pedals and you may have yourself a winner. 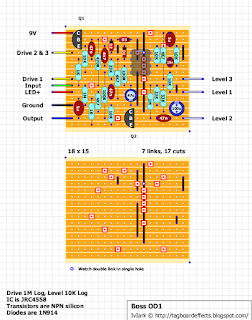 Very similar to the Drive Master posted a couple of days ago, but thought I'd include the full layout to keep things complete. 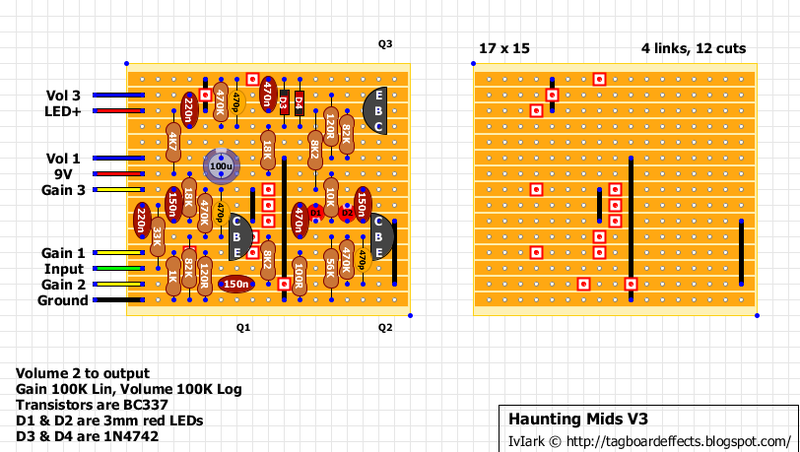 This version with a diode/LED switch as per a request I had. 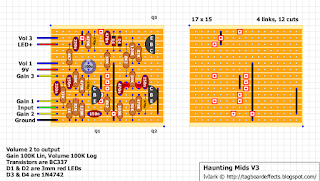 If you'd prefer yours to be like the original and have fixed LEDs rather than this switch, then just solder in LEDs directly on the board as per the Drive Master layout. The 10u cap will need to be moved 3 columns to the right. From an 80s Marshall ad: Fire your cartage company. You don't need a rack full of gear to get distortion that goes from subtle to stun gun. If you want all the range of a top studio pro, the Drive Master is for you. ...And what's behind door number two?! Heh. 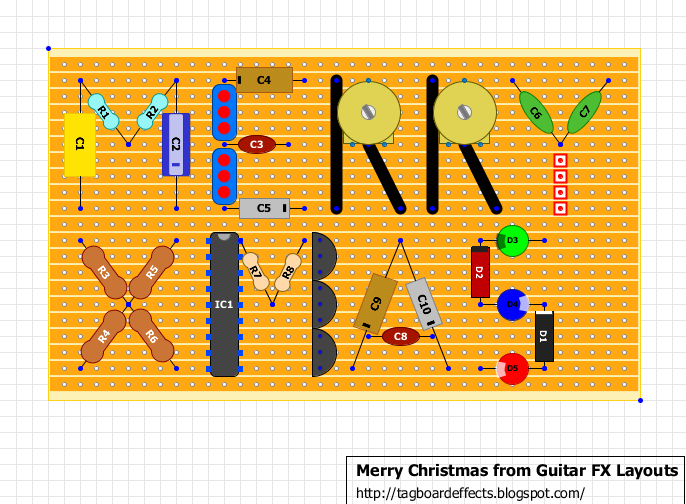 We talked about doing a "Layout advent calendar" for you all. 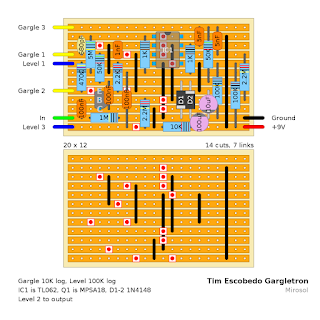 Mark started on the 1st of december with Landgraff M'OD, and i'm continuing with another Escobedo circuit - The Gargletron. Original sample of the sound can be heard here. "Talking" type effect, two parallel MFB filters tuned by a single 10K pot. 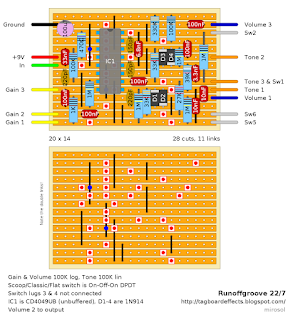 Similar to EH Talking Pedal and Craig Anderton's Wah/Anti-Wah design. Gives good wovel sounds. 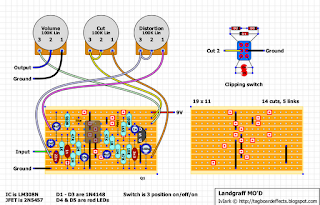 Should be pretty obvious what this one is based on but people rave about it and it does have subtle differences in the schematic, not least of which the clipping switch, that will make this one a worthwhile build. Bring home the John Landgraff Mo D and watch as your strings bring out a totally new kind of sound. This Landgraff distortion pedal gives out legendarily amazing sounds of distortion effects. With a 3-position selector switch, this vintage distortion pedal allows you to choose between 3 varieties of distortion to enhance your strum. This Landgraff distortion pedal is the second pedal to be created by the leader of pedals and amps, John Landgraff. Users have praised this vintage distortion pedal as giving out simply outstanding, creamy distortion, without a background buzz, characteristic to many other amps. The John Landgraff Mo D will give you distortion like never before and leave your audience craving for more!